River North has been invaded by a number of generally indistinguishable upmarket corporate chains lately, but the Chicago incarnation of a Scottsdale-based division of a Japanese-ish restaurant with locations in London and Hong Kong merits attention. 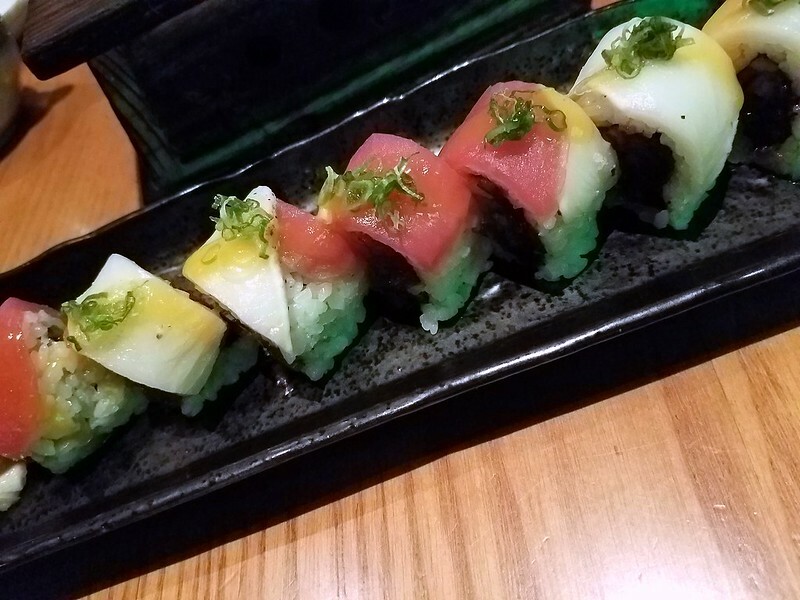 Billed as "Sushi and Steak," Roka Akor is like a stylish, modern-day Ron of Japan or Benihana for the capitalist class, but with really fabulous food. 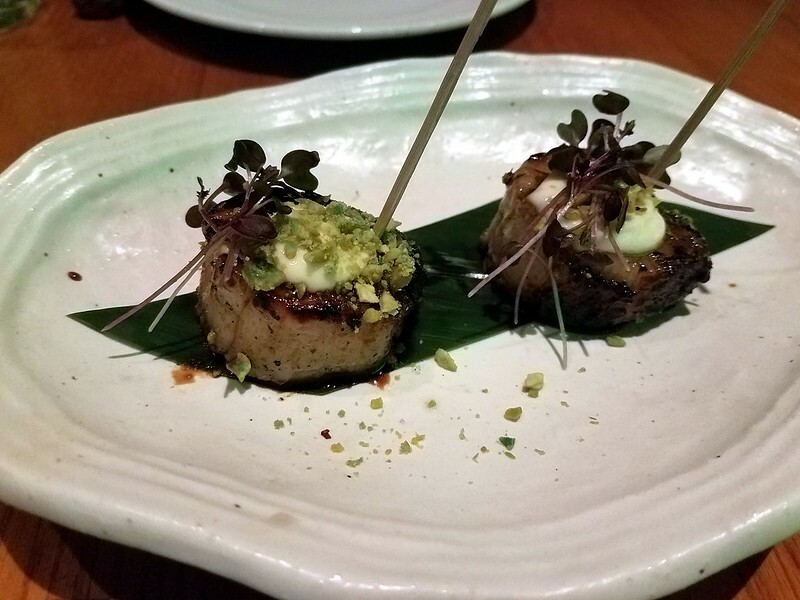 If you ignore the offensive prices and garish clientele, Roka Akor excels in each of its varied roles: sushi destination, serious steakhouse, and contemporary Asian eatery. We've sampled much of the menu at both lunch and dinner, and at this point, I'm generally more excited to eat at Roka than I am at Sunshine Café, Renga Tei, Arami, or Katsu, at any number of the places around town where you can a very good steak, or at Slurping Turtle or either of the Bellies. The restaurant offers an impressive selection of raw fish, including daily specials (last night we had some variation of aji that I had never heard of plus some cousin of snapper that were doubtless endangered and soaked in radioactive cesium), all accompanied by real deal wasabi grated before your very eyes. Any of the steaks are great, cooked exactly as requested and with a fabulous char, exactingly pre-cut in chopstick ready slices. Simply grilled fish is exactly that, and right on each time. 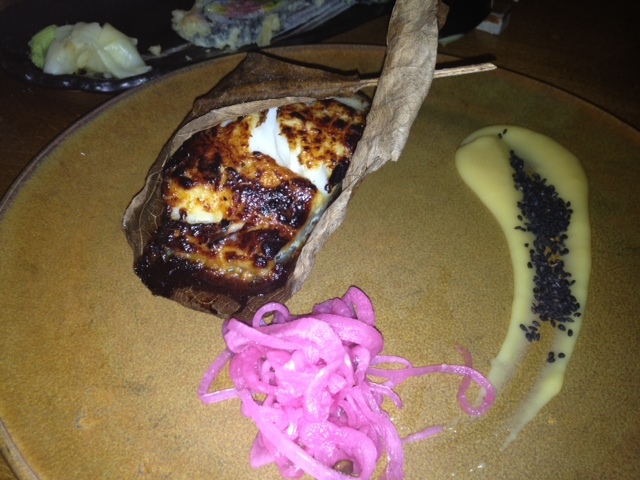 (A rare food-related misstep is the disappearance of grilled mackerel from the menu.) Other entrees, like the barley miso chicken, are worth a detour. The quality of everything they serve is extremely high, and the preparation accurate and consistent. 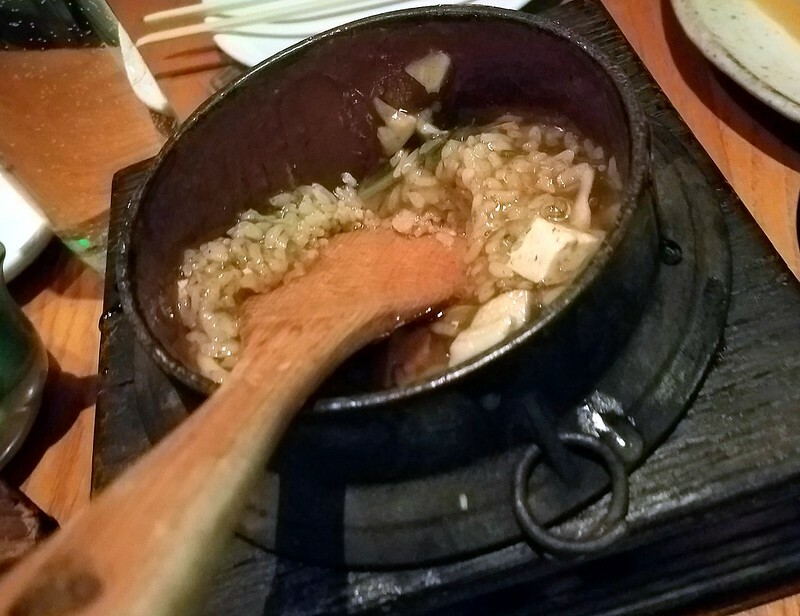 Even the miso soup exhibits remarkable depth of flavor. At $8 for a bowl of the red variety—with lobster, natch—it better. Roka Akor may be the rare place where self-professed foodies and cocktail-swilling culinary philistines in short skirts and untucked buttondowns can coexist. It takes some effort to subjugate the ickiness of the restaurant's corporate provenance, the waitstaff's shameless upselling, and the obnoxious scene. Cheap, it is not—although there are deals to be had, including a four-course executive lunch and a happy hour appetizer omakase. But even at full price and considering all the foibles that may make the restaurant a less than ideal destination for LTH's discerning readership, Roka Akor should be near the top of any good eater's list of places to visit. Last edited by jonathanlehman on December 19th, 2011, 12:34 am, edited 3 times in total. I think you sum it up really well. 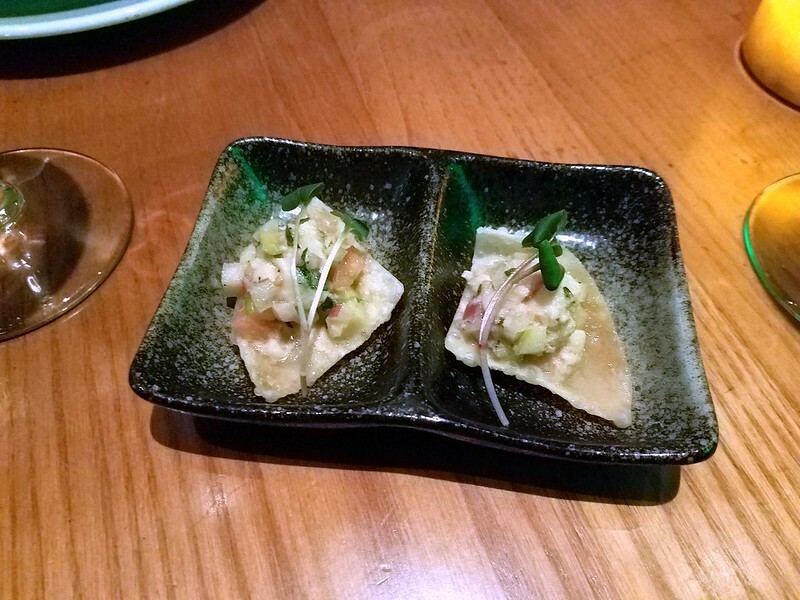 The quality at Roka Akor is high but the price for that quality is a steep one to pay, not just monetarily but also via some of the other elements, which you cover quite well -- and humorously -- in your post. I was there late on a weeknight and it was about as unbearable as I can imagine. Are there times when the place isn't such a ridiculous scene? ronnie_suburban wrote: I think you sum it up really well. 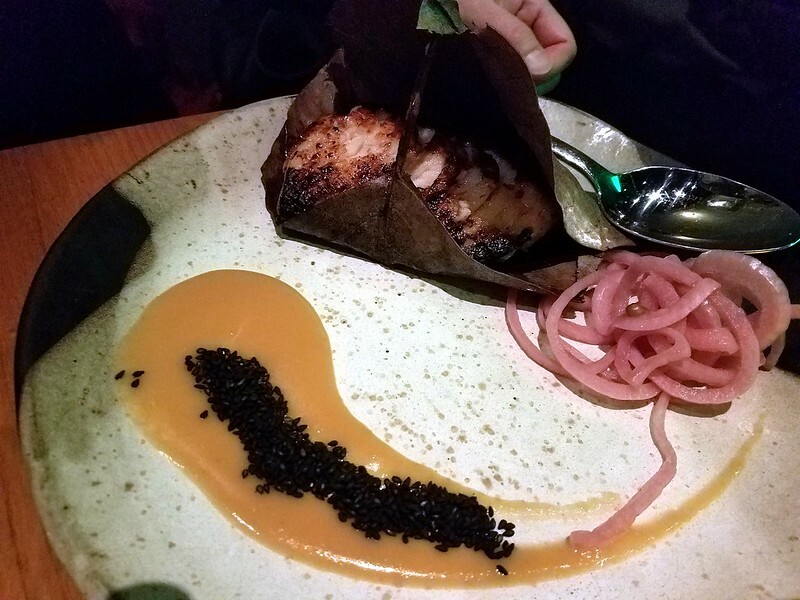 The quality at Roka Akor is high but the price for that quality is a steep one to pay, not just monetarily but also via some of the other elements, which you cover quite well -- and humorously -- in your post. The restaurant has been pretty empty for weekday lunch, which is when I prefer to go. Early evenings and Sunday seem to be okay, as well. Late Saturday (11:15) the dining room was calming down, but the bar was still hopping. The fact that there is pretty fun people watching when it's crowded is a slightly redeeming feature. But thankfully there are usually enough people dressed down that I don't feel out of place if I don't bust out my strappy heels and slutty top! Although I wasn't paying, I do think that the prices are reasonable given the location & scene, and the quality of ingredients. For four people, we had the above pictured dishes, 2 orders of maki, an order of wagyu and kimchi dumplings, rock shrimp tempura, scallops, butterfish tataki, grilled asparagus, edamame, chocolate cake dessert, a bottle of wine, 3 glasses of wine, and a cocktail for $350 before tip. More than enough food for 4 people. However the grilled items are AWESOME much better than anything I have had in Chicago in this style. Nice char, taste of smoke, and heads and tails above Slurping Turtle, Union, or any of the izakayas that have come and gone. (Need to try Yusho.) I very much look forward to going back on somebody else's dime and enjoying…. For the first time ever I almost ordered a second corn on the cob to go with my steak…. 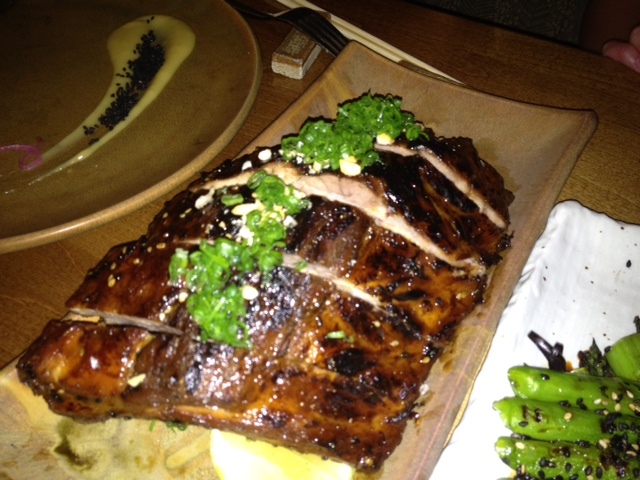 Had dinner last night at Roka Akor, River North location. For a starter I had the sashimi style of scallop and hamachi. A large diver scallop had been cut into 3 and very thin pieces of lime placed inbetween the scallop slices, this was excellent as was the quality of the hamachi. The lamb ribs with Korean spicing are outstanding, served with a dipping sauce containing Korean red pepper paste. We also tried a piece of waygu from Japan, this one in particular was a strip cut from a waygu cow that was fed the leftover mash from a sake distiller. (they normally carry 3-4 different kinds of Japanese waygu). Delicious. Bone marrow is a not a worthwhile side to order, too much tempura bits and the serving is a small single half of a bone. A new veggie side of blood orange and snap peas was quite refreshing and tasty. FWIW, the two times we've been I didn't notice any upselling, perhaps because we knew what we wanted. Visited the Old Orchard location because it was convenient to our activities that day. In the end, we left with very mixed feelings. The food, thankfully, was the highlight. 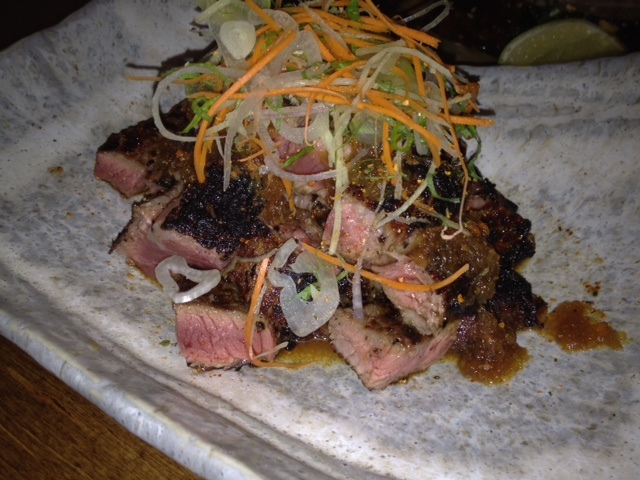 Given the, uh, "atmosphere," we were quite pleasantly surprised at the uniformly high quality of the food. The rest was either depressing or just not good. This location is in the mall and it felt just like any other place in the mall: people constantly coming in and having a quick bite and leaving. Given the price point and the menu, we hadn't really expected that; despite the menu and the price point, it feels like just another mall restaurant. That and the eagerness to turn the table really turned us off. I had barely put the last bite of sushi from the plate into my mouth than someone literally took the plate out from under me. I had barely begun to chew the bit of sushi and it would have been nice to have the sliced ginger still there, but it was not to be. Just before that, this same guy had cleared all the rest of the plates and was busy wiping the table down for the next customers. There are a lot of places that I would expect that, but this is not one of them. Very good, although pickled onions may not be the best choice of an accompaniment. We get the intention but not the flavor combination. This was really quite good but we would have been even happier if we had seen more than three or four mushrooms in the entire pot. Frankly, notwithstanding the quality of the food, I simply don't see returning. If you're going to charge what you charge, at least treat your customers better than if you're a corner diner. Gypsy Boy wrote: That and the eagerness to turn the table really turned us off. I had barely put the last bite of sushi from the plate into my mouth than someone literally took the plate out from under me. 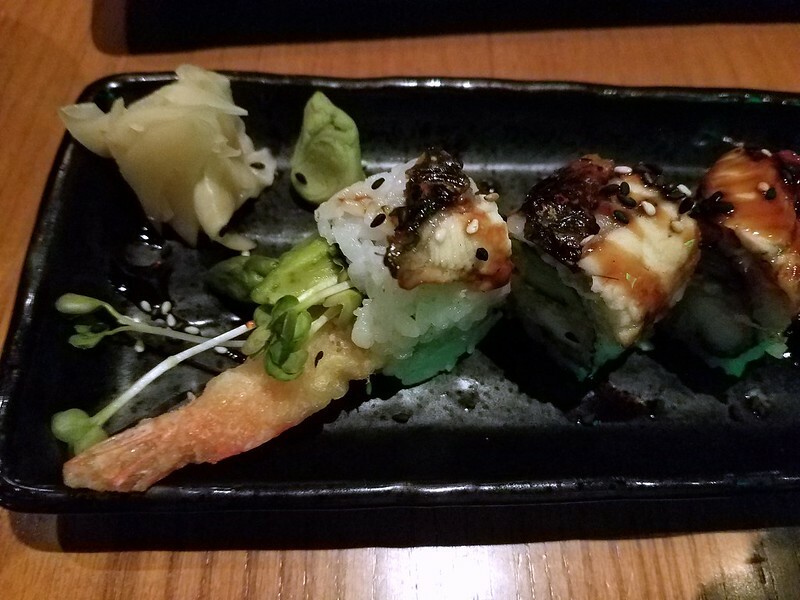 I had barely begun to chew the bit of sushi and it would have been nice to have the sliced ginger still there, but it was not to be. Just before that, this same guy had cleared all the rest of the plates and was busy wiping the table down for the next customers. There are a lot of places that I would expect that, but this is not one of them. It is really crazy that we have come to expect this crap at ANY restaurant. Management should not need to tell people this is rude, but if they have to, then train your staff. I am extremely tolerant of service, but rushing plates away and nonsense like this is a problem for me. If you think the "atmosphere" at Old Orchard is bad, you'll definitely want to stay away from their River North location. I'm not sure which, but it approximates one of Dante's circles of hell, maybe all of them combined. ronnie_suburban wrote: If you think the "atmosphere" at Old Orchard is bad, you'll definitely want to stay away from their River North location. I'm not sure which, but it approximates one of Dante's circles of hell, maybe all of them combined. Thanks for the tip; nice to know before we descend. A pity, though, particularly since we both thought the food quite good. FWIW, Roka Akor has buy $100 gift card get $25 bonus going on. $25 bonus is good for first 3 months of 2019.